As if Capcom could make a Street Fighter game without one of its most beloved characters, the house that Mega Man built announced today at the 2015 San Diego Comic Con that Ken will be joining the roster of fighters in the PlayStation 4 exclusive title, Street Fighter V. The master of the flaming Shoryuken has been confirmed and is now playable on the Comic-Con show floor. If you are at the con, the Capcom booth is #215 but I’m sure there will be a long line to try the game out. 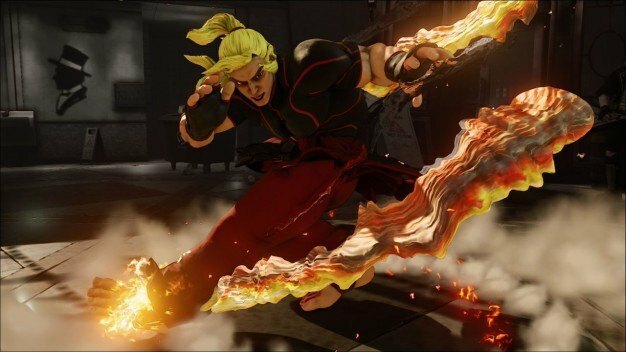 Ken is definitely one of the key protagonists in the legendary Street Fighter series, and he brings with him an array of new abilities to Street Fighter V, where his tricky mix-ups and flashy combos have the ability to bewilder opponents and deal huge damage. Ken joins the six previously-announced characters Ryu, Chun-Li, Charlie Nash, M. Bison, Cammy and Birdie, with plenty more new and returning characters still to be revealed. Also, don’t forget that the first online beta event for Street Fighter V will be exclusive to PlayStation 4 players and will run for five days, starting from July 23 (6pm PDT) through July 28 in North America and July 24 (3am CEST) in Europe. In North America, those who pre-order the game through select retailers or through PlayStation Network (PSN) will be granted automatic access to the beta. In Europe and Asia, players interested in participating in the beta program can visit www.streetfighter.com and follow the various steps to sign up for a chance to join the fight! Additional beta programs will be taking place throughout the rest of the year and more details will be shared at a later date.